Stuck in the quotidian grind of work-work-work? Looking to experience something other than Cyber Hub? We understand that not all of us have a similar to-do list when it comes to winding down after a hard day at work; while some of us may fancy a drink or two, others may prefer something like performance arts or a calm stroll through the park. Here are five places in Gurgaon which offer varied experiences and opportunities for you to unwind. Nestled in the heart of Sohna road, V Club is a place for those looking to relax amidst a peaceful environment away from the noise of the city. 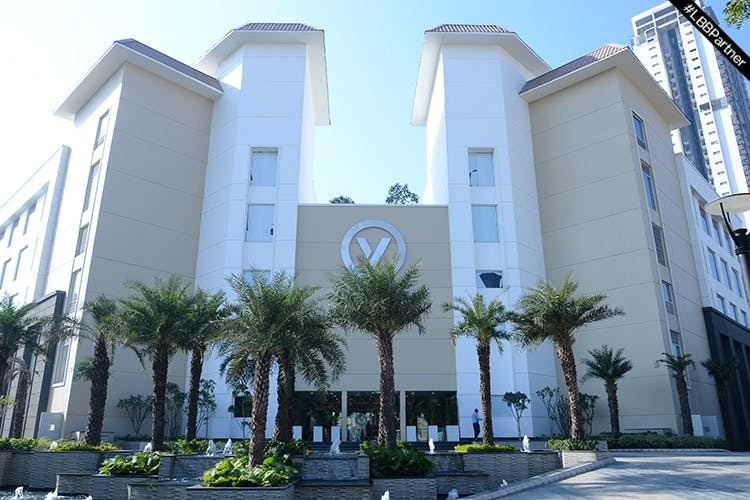 Housing a swimming pool, gym & Zumba/yoga studio, 24-seater theatre, poker & bridge room, indoor badminton, table tennis and squash courts, V Club offers a lot of opportunities to wind down and de-stress under one roof. Head here to enjoy alfresco-style dining in a multi-cuisine restaurant, deli & sports bar. Exclusively reserved for members, the club is a respite for those looking for a private members club with world class amenities at a nominal price. Now, you don’t have to drive down to Delhi to find a great place to chill out. V Club also offers facilities for non-members, which include lavish banqueting spaces spread across 25,000 sq ft in six different venues, with 20 rooms to complement a getaway for families, events and group corporate outings. #LBBTip: V Club offers membership at different rates, starting from INR 25,000. Memberships are available for one, five and 10 years. The sprawling grass carpet beneath your feet, musical fountain, free yoga classes, performance training camps and a rose garden; that’s Leisure Valley Park in Sector 29 for you. If you’re a nature lover and a serene environment helps you wind down, Leisure Valley should be high on your list. It also has a restaurant named Roots, offering delish French press coffee and Bombay Egg Bhurji. Head here after office to take a walk or meditate. Are you the type of person who would rather spend your work-week evening perched inside a spa getting rejuvenated? Head to Sawasdee Thai spa, then. Sign up for Lotus Signature Body or Swasdee Signature Spa to relax your muscles and improve blood circulation. For a complete list of spas in Gurgaon, click here. If, like us, the only thing that helps you relax after a hard day at work is to sit back and indulge in some arts & culture, Epicentre in Gurgaon is most definitely the place to go. The 40,000 sq ft of exhibition halls, auditorium, cafés/restaurants and amphitheater ensures that the art lover in you always has something to delve into here. So, where are you headed to after office today? Let us know! This story is in partnership with V Club.